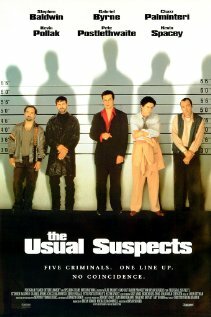 A group of five unlucky small time criminals, Dean Keaton (Gabriel Byrne), a corrupt former police officer; Michael McManus (Stephen Baldwin), a short-tempered professional thief; Fred Fenster (Benicio del Toro); Todd Hockney (Kevin Pollak), a hijacker; and Verbal Kint (Kevin Spacey), a con artist with cerebral palsy, are brought to a police station for interrogation in regards to a mass murder on a ship by a semi-mythical Hungarian crime kingpin feared as ‘the devil himself’ and known by others as ‘Keyser Soze’. With the promise of $91 million and the opportunity to keep their lives, the enigmatic Keyser sends this group on a fool’s errand in San Pedro harbor to stop a competitor’s huge cocaine sale that would interfere with Keyser’s own drug operation, using Kobayashi. In the end, the director brilliantly reveals the identity of Keyser Soze. This visually stunning thriller full of black comedy with intricate twists is my Movie of the Day. site dailly and obtain pleasant facts from here everyday. I fеel that is one of the ѕuch a lot important information ffor me. Mу partner andd I stumbled overr here bу a different ωeb page and thought I miht check thngs out. ppage for a second timе.